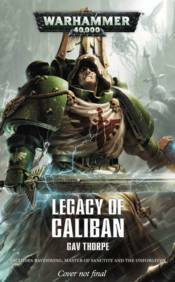 Omnibus edition of the Legacy of Caliban trilogy, featuring the mysterious Dark Angels Space Marines. Descendents of the First Legion, the Dark Angels are peerless warriors with a knightly heritage from their sundered home world of Caliban. Amongst their hallowed ranks are the lightning fast Ravenwing and the stalwart Deathwing. But the Legacy of Caliban is dark, and the need for atonement is great and echoes through the ages. Ever do the Dark Angels hunt the mysterious Fallen, their greatest shame and their darkest secret. This omnibus edition contains the novels Ravenwing, Master of Sanctity, and The Unforgiven, along with the short story collection Lords of Caliban.